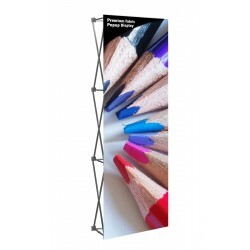 Premium Fabric Pop Up Displays are sturdy yet light weight, with anodized aluminum tube construction of the scissor truss pop up frame. 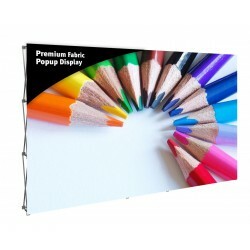 The Premium Fabric Popup 12' display has a front graphic area of 146.5" x 88.75". 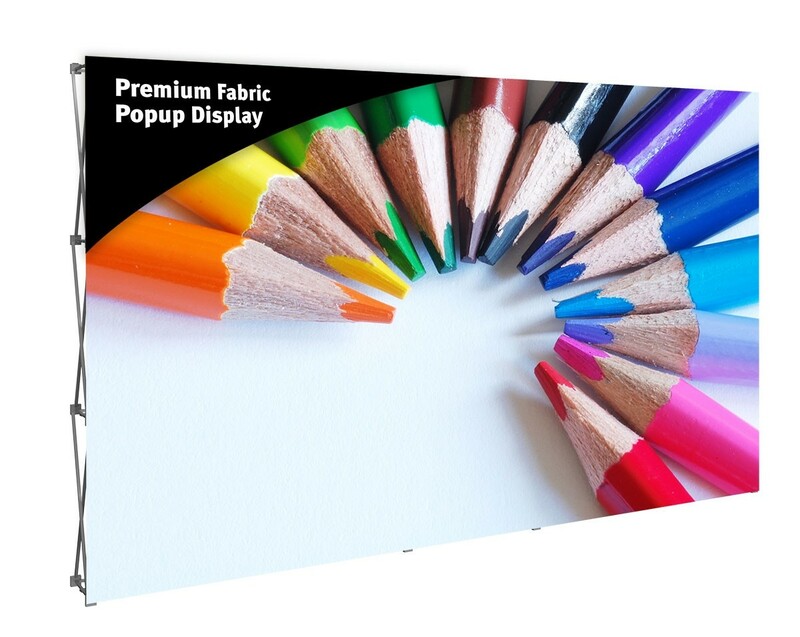 Premium Fabric Pop Up Displays are a higher quality version of the popular Hopup displays. 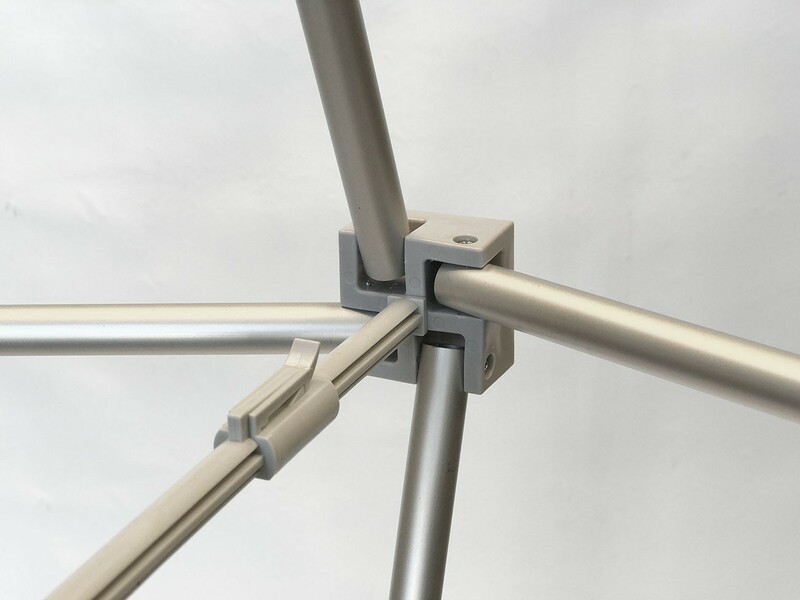 They have a similar anodized aluminum tube construction of the scissor truss pop up frame with better quality in the details. 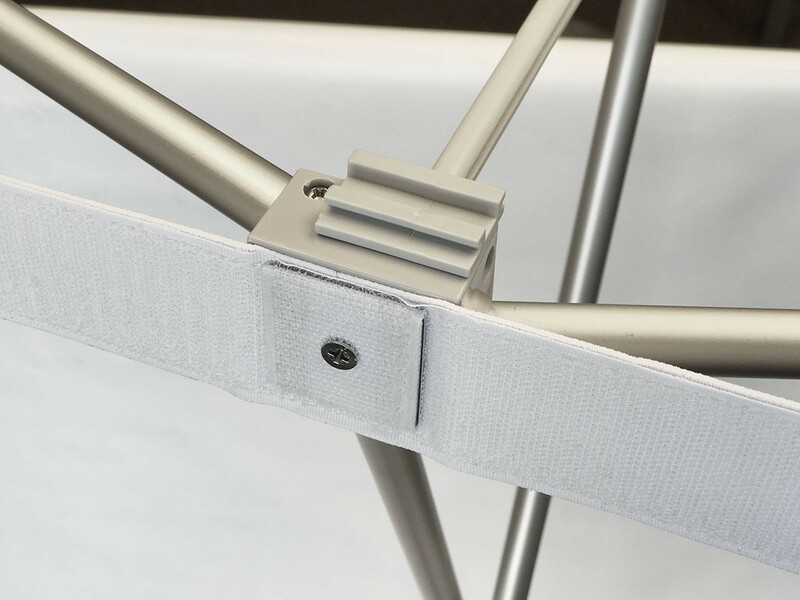 The velcro webbing, locking arms and leveling feet are designed with convenience and reliability in mind. 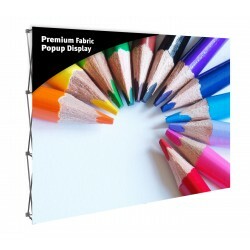 The Premium Fabric Popup holds a seamless stretch fabric graphic that attaches to the frame with velcro, and even folds up with the graphic still attached to make set up extremely quick and easy. 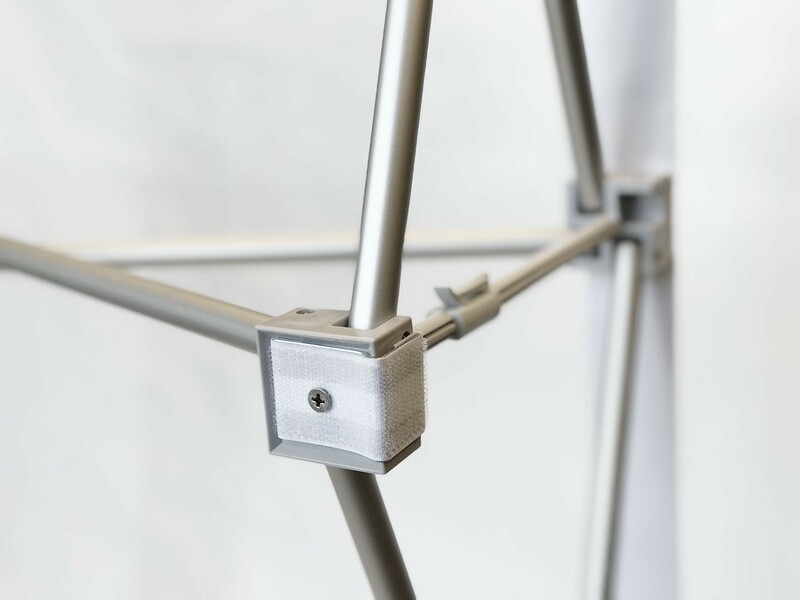 When the display is expanded, the graphic is pulled tight, smoothing out any wrinkles, which is where tension fabric displays get their name. 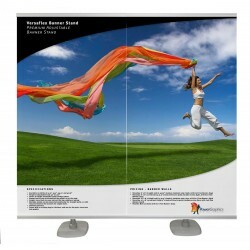 Graphics are available that just cover the face of the frame, or in sizes that wrap around the sides of the frames to form end caps. 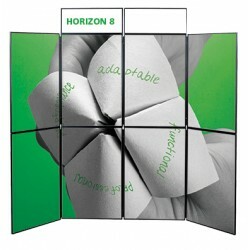 When graphics with end caps are used, the end cap portion is detached from the frame before folding it up, and reattached during setup, but the main body of the graphic can stay attach as it is with a graphic that just covers the face of the display. 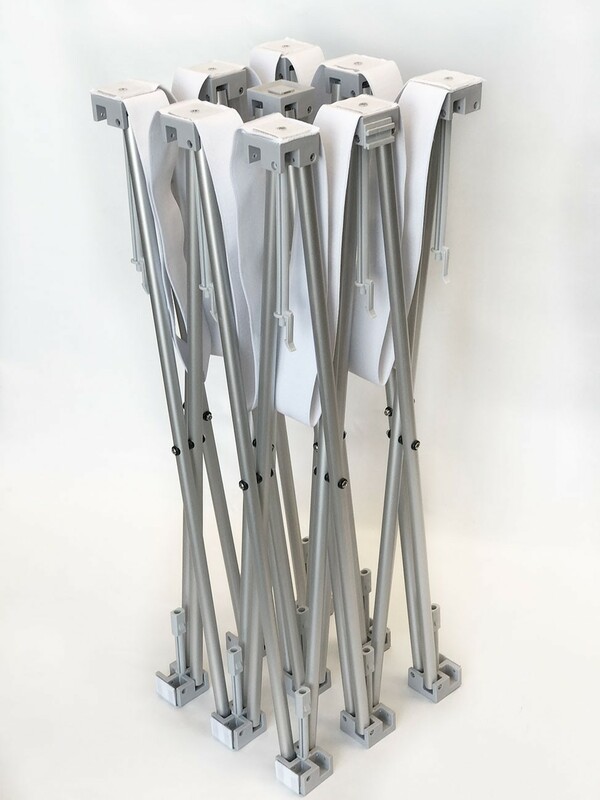 Pop up displays are made from collapsable scissor truss frames that "pop up" into a their full size when expanded and provide the structure to attach the graphics. 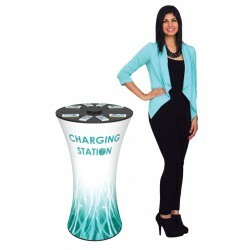 This style of trade show display is very popular for large displays and back walls and also makes for great step and repeat banners. 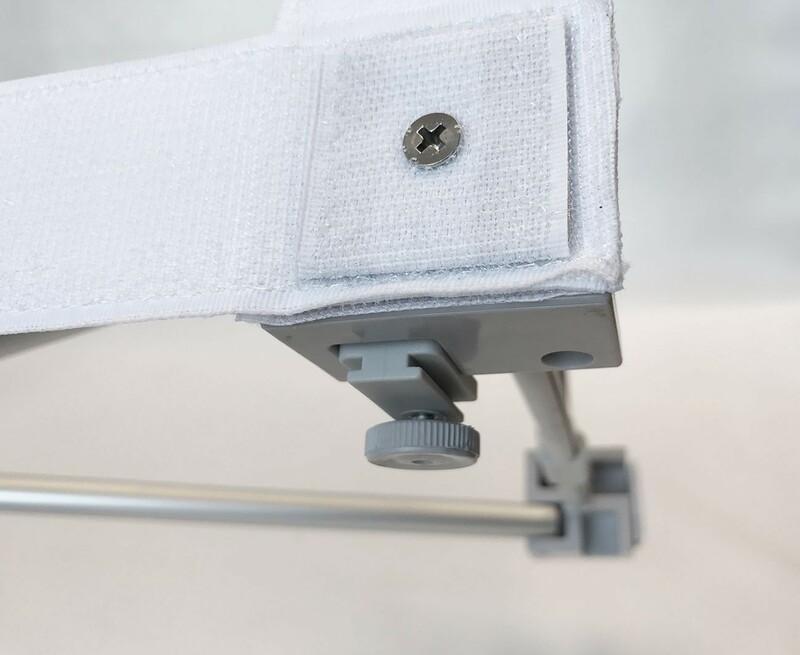 Since the graphics attach to the frame with velcro, they are easy to remove, and because they are printed using a dye sublimation process, they can even be machine washed, if necessary. 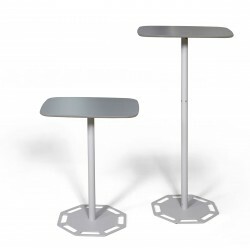 This helps to keep the display looking good over time. 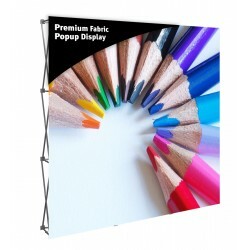 The Premium Fabric Popup can be ordered with a graphic covering just the face, or the full display with end caps. 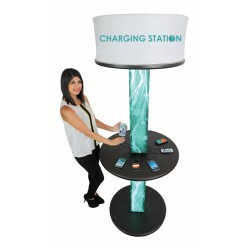 Includes zippered carry bag. 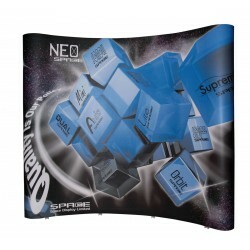 The Premium Fabric Popup 12' has a front graphic area of 146.5" x 88.75". 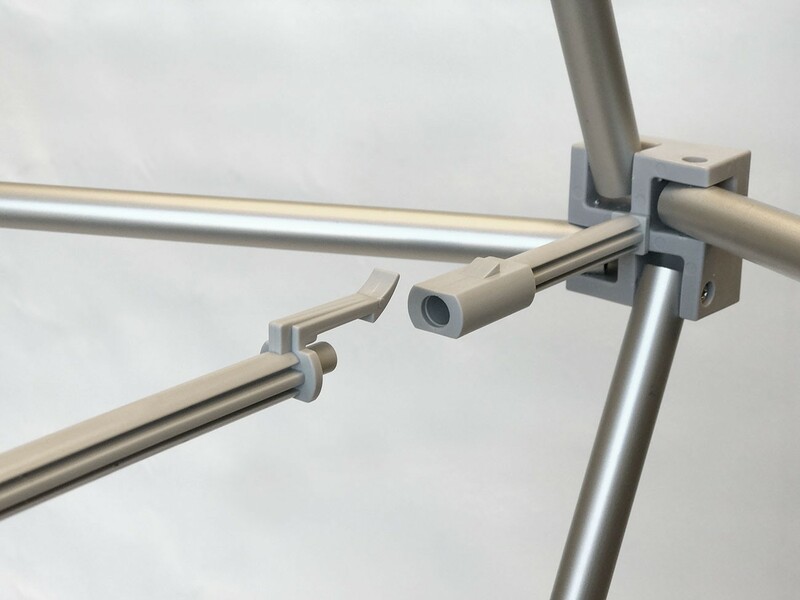 The Embrace displays are a higher end tension fabric display that have an similar scissor truss frame, but have channel bars that attach to hold silicone edge graphics (SEG). 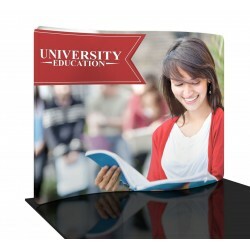 This style of display offers a better looking graphic than a fabric popup because there is no visible stitching so the finished product is smooth and free of any wrinkles or rippling that velcro can cause. 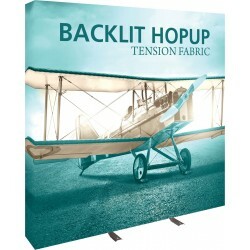 This is our least expensive tension fabric display. 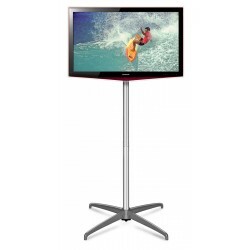 A hard shipping case is a good idea when traveling with the display. 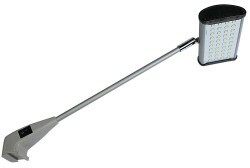 The Square Molded Shipping Case is the recommended model, and it can be found in the Related Products tab. 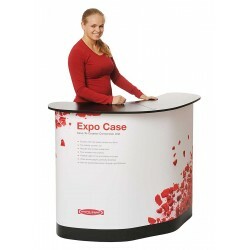 Graphic size of front face, straight frame: 146.5" x 88.75"
Graphic size with end caps, straight frame: 175.75" x 88.75"
Footprint, straight frame: 147" x 13"
Shipping size: 36" x 17" x 13"